Expedition 14 spacewalkers Sunita Williams (left) and Michael Lopez-Alegria disconnect a series of flex hoses and fluid lines from an unneeded ISS ammonia coolant reservoir during their Jan. 31, 2007 excursion. WASHINGTON-- Two NASA astronauts kicked offthe first of four tightly-packedspacewalks outside the International SpaceStation (ISS) Wednesday by carefully overhaulingpart of the orbital laboratory's cooling system despite the last-minute find ofa few toxic ammonia flakes. ISSExpedition 14 commander MichaelLopez-Alegria and flight engineer SunitaWilliams successfully switched four liquid ammonia coolant lines from atemporary set up to their permanent configuration during almost eight hours ofspacewalking work high above the Earth[image]. The workwas slow and demanding, but paid off as Lopez-Alegria and Williams activatingthe new cooling loop near the midpoint of the seven-hour, 55-minute spacewalk [video]. The onlyhint of leaking ammonia occurred near the end of the spacewalk, when Williamsreported about four small "flakes" of frozen, yet toxic, ammonia drifting outof a fluid line cap during a completely different task. "Whoa,"Williams said, adding that the coolant did not appear to contaminate her Lopez-Alegria'sspacesuit. "I am pretty positive that it didn't get in any contact with hisspacesuit." Ammoniacontamination has been a concern since2001, when a cloud of frozen ammonia flakes bloomed around NASA astronaut RobertCurbeam as he too handledISS cooling system lines. "At verylow levels it could be an irritant," Derek Hassman, NASA's lead Expedition 14flight director in a post-spacewalk briefing, of ammonia coolant, adding thathigher levels could have more serious effects. "It can have a significantimpact on the crew's respiratory function." But unlike the2001 incident, where contamination was known and required extreme cleanupmeasures, today's ammonia sighting fell under "suspected contamination" andcalled for only minor preventative steps, NASAofficials said, adding that all tests were negative for ammonia contamination. "We didn'tintroduce any ammonia into the airlock or into the habitable region of thespace station," Hassman said. Lopez-Alegrialater described the flakes as rectangular and narrow, adding that a bit ofplastic he saw earlier in the cooling line work may indeed have been bit offrozen ammonia. Thespacewalk, Lopez-Alegria's seventh career extravehicular activity (EVA), markedthe first of an unprecedented three excursions in nine days (and four overallin the coming month) for an ISS crew. It is the most densely packed series ofspacewalks to date for space station astronauts outside of a visiting space shuttle mission. The EVAmarked Williams' second career spacewalk. Thespacewalk began at 10:14 a.m. EST (1514 GMT) as the ISS passed 220 miles (354kilometers) over the South Atlantic. Expedition 14 flight engineer MikhailTyurin, who remained inside the ISS during the spacewalk, helped hiscrewmates don and doff their spacesuits and watched over the station's systems[image]. "Beautiful,"said Lopez-Alegria as he and Williams began their spacewalk. "Looks like just alittle bit of a circular storm down there." Duringtheir cooling system overhaul, Lopez-Alegria and Williams rerouted ammoniacooling lines from their temporary track through the space station's mast-likePort 6 truss into a final setup that runs through a series of heatexchangers in the outpost's U.S.Destiny laboratory [image]. "It wasworth it taking our time," Lopez-Alegria said. "We ran into a few things, butit's all good." The work isvital to prepare the station's power and cooling systems to handle futureinternational laboratories. It also helps to ready the station's Port 6 trussfor its relocation to the edge of the orbital lab's port truss segment in a Septembershuttle mission. Theastronauts primarily handled the station's Loop A cooling lines, whichtransport heat away from the Destiny module's environmental control systems andexperiment hardware. But it was hard work, especially on the astronauts' hands.NASA commentator Rob Navias likened the activity to working on your car enginewhile clad in a snowsuit and gloved hands. "My handsare toast," Lopez-Alegria said near the spacewalk's end. Thestation's Loop B cooling system, which oversees station payloads and flightavionics, will be reconfigured in a mirror image of today's spacewalk set forFeb. 4. In additionto their cooling system work outside the ISS, the Expedition 14 astronauts alsoprimed a pair of cables to help transfer power between the ISS and NASAshuttles during future missions. They also secured a defunct ISS radiator -- nolonger needed after today's cooling system overhaul -- and stripped one of twofluid lines from an unneeded ammonia coolant reservoir [image]. Lopez-Alegriaand Williams ultimately ran out of time and were unable to complete a laundrylist of extra chores set aside for them, but they or future spacewalkers willhave the opportunity. GlendaLaws, NASA's lead Expedition 14 spacewalk officer, said the extra tasks --known as get aheads -- could be added to one or both of the next ISSspacewalks, but completing the cooling system overhaul remains a priority. Wednesday'sspacewalk marked the 78th EVA dedicated to ISS assembly, the 50thstaged from the orbital laboratory itself, and the 30th to begin atthe outpost's U.S. Quest airlock. 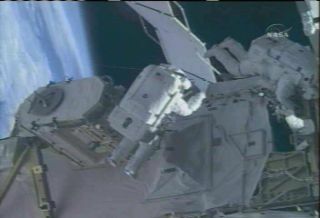 Thespacewalk also pushed Lopez-Alegria to the rank of fourth all-time spacewalker(up from 13th), with a total EVA time of 47 hours and 31 minutes.Williams, for her part, is now the second all-time female spacewalker with 15hours and 26 minutes. The secondof the upcoming four Expedition 14 spacewalks is scheduled begin at 8:30 am. EST(1330 GMT) on Sunday, Feb. 4, and will be broadcast live on NASA TV.